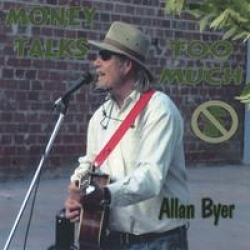 Money Talks Too Much is the latest album by Central Oregon songwriter Allan Byer. This album has an awesome mix of songs from spiritually-based ballads to Roots Rock or Americana in Allan's unique singer-songwriter style. Produced by Dean Prescott at Mirror time records in Prineville, the album features Ed "the Whistler" Sharlet, Dean on harmony vocals, lead guitars, and percussion, as well as Halla Byer singing harmonies. Allan mans his usual rhythm guitar, harmonicas, and lead vocals.